Here we Define Kaizen Events, Blitzes, and the 5S Concept. 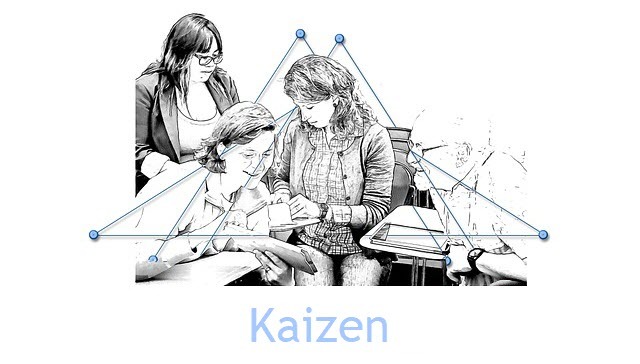 If you asked most US managers to define kaizen, there's a good chance they wouldn't have heard of the term. However, this Japanese philosophy could be very important to them. Kaizen focuses on continually improving business and manufacturing activities, and it creates a significant difference in the way businesses operate. Kaizen aims to improve standardized activities and processes, and thus eliminate waste. While this principle was first implemented in Japan after World War II, it has since spread to other organizations worldwide. If we define kaizen literally, it means simply "improvement", or more literally: "good change". You can find similarly pronounced words with the same meaning in Mandarin and Korean, as well. However, there are more nuances to kaizen's meaning when it comes to business practice. In Japan, it's a common practice to label continuous improvement methods with this word, such as the practices started by Toyota, but often imitated elsewhere. In English, we usually take the word to mean methods of implementing improvement on a continuous basis. Japanese companies actually distinguish between innovation, or radical change, and kaizen. The Kaizen theory is an activity that needs to be performed on a daily basis, and it goes beyond simply improving productivity. This process adds a human element to the workplace and eliminates excessively hard work. Instead of just working hard, employees are encouraged to use scientific methodology on their own activities. They essentially perform experiments on the processes they do day to day. This might seem inefficient in the short run, but in the long run it permits each worker to more effectively control his or her activities. Employees learn to see and eliminate waste. Manufacturing doesn't traditionally require much thinking. It's dominated by repetitive tasks that are done almost on human auto-pilot. We define kaizen principle as a method of encouraging workers to avoid this tendency. It allows them to voice their personal ideas about how to minimize the 7 wastes, and it keeps a company running smoothly. However, it's not just the floor workers who participate in the kaizen continuous improvement process. Anyone in an organization, from the CEO and outside stakeholders to the lowest worker on the ladder, can be involved in this system. There are even several different formats available. Some organizations use individual kaizen setups, while others use suggestion systems or small or large group organization. Toyota, the most commonly emulated company that uses kaizen, generally uses a small group that improves its own environment and productivity within a local area or a workstation. The line supervisor might be responsible for guiding this group through the process, and this might be that supervisor's main job. If any abnormality occurs during production, ever worker on that line stops production. Then, they work with the supervisor to find an improvement which will resolve this situation. The define kaizen cycle has five standard phases. It starts with standardizing an operation, then measures that operation to find the cycle time and how much inventory is in process. These measurements are compared to the requirements. Then, innovations that will meet the requirements and raise productivity are offered. These new operations are standardized as before. Then the cycle repeats. Kaizen tends to focus on small improvements, rather than large, overall efforts. This can make kaizen seem inefficient to some. However, when many small improvements are added together, they can yield enormous results in terms of better productivity and less waste. This is a much different philosophy from the usual command and control types, which make large scale improvements from the top down, without much worker input. A well define Kaizen involves making changes, then monitoring what happens. Adjustments are then made to produce the desired result. Instead of large scale planning and scheduling, much smaller units are used. These are easier to adapt as new improvements come along. The major results of kaizen tend to be better efficiency and an elimination of wasteful work. This process encourages cleanliness, organization, standardization and discipline among employees, too. It's also important for companies using kaizen to have a way of dealing with cases where workers make suggestions that don't fit in with the company's current targets. A subtype of kaizen is the focused kaizen (also called a define kaizen event or kaizen blitz). This kind of event is a limited one, designed to address just one issue over the course of a week or so. The results of this kind of kaizen are generally used later on in other focused events. However, the kaizen blitz is generally a reactive process. In it, people check to see if something is wrong, then fix it. To function for higher level processes, it needs to incorporate an element of creativity, so that things that aren't actively wrong can also be improved. Within ISO 9001, this is considered a preventive action or a corrective action process. As a method of improving business efficiency and productivity, kaizen can work very well. However, it's important for managers to use it correctly, allowing input and experimentation from workers. Because of this, it may be difficult to implement in companies that are used to a top-down improvement model. It's also vital to recognize the limitations of kaizen. It doesn't work for every kind of situation, or for every kind of improvement. Used correctly, however, kaizen can be a valuable tool in business.